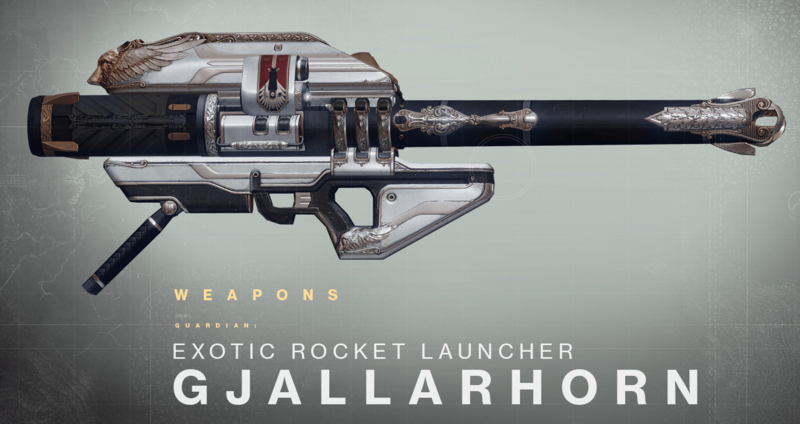 Gjallarhorn is one of two Heavy Exotic Rocket Launcher’s currently in the game, this one deals Solar damage. The good: Highest velocity, smaller tracking missiles. The bad: Low rate of fire. Conclusion: Amazing destruction capability for many situations. Yelling horn, or Gjallarhorn, is an Exotic rocket launcher sold by Xûr, won in the Cryptarch lottery, or received as a reward from PvP/PvE. It’s named after the mythic trumpet from Norse mythology that brings about the onset of the destruction and renewal of the universe. One of the most powerful weapons in the game, it certainly lives up to its majestic name. The launcher shoots out rockets, while secondary sentries deploy at the site of impact to devastate foes that pass nearby; it’s got major destruction capability! As if hitting your enemy with a missile wasn’t deadly enough, this weapon ensures any targets left in the vicinity after the initial blast will also be demolished. Sometimes you can dodge 1 rocket, but not even Lord Shaxx could survive the payload of seeking missiles Gjallarhorn emits. Statistically, Gjallarhorn is excellent, and excels at medium-long range firefights. The area of effect damage from the tracking Wolfpack Rounds are devastating. It’s also got the highest velocity out of any rocket launcher in Destiny. The blast radius is low compared to many other rocket launchers, but thankfully the tracking missiles can usually be relied on to deliver the extra punch. The perks that come with this weapon do not allow for much customization. Aiming and reloading quicker are decent upgrades, but don’t bring much to the table, and Quickdraw is much less useful compared to the others. Ultimately you’ll have to choose what perks you want based off your playstyle. This weapon is truly a work of art. Golden wolf heads adorn almost every inch of the weapon. The weapon’s designer, Mark Van Haitsma, added a wolf head for every day he spent working on it. 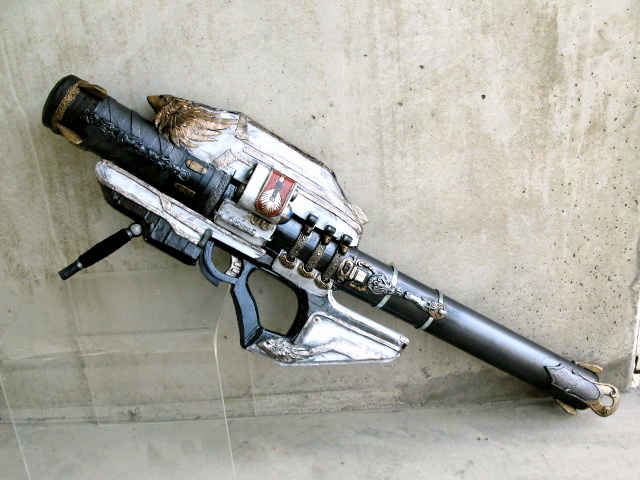 Gjallarhorn was a gift to the Guardians who fought the Battle of the Twilight Gap, and forged from the armor of the Guardians who fell in battle. This gives a very somber feeling to those wielding the weapon, as you are helping fallen Guardians continue their fight. The sight is also very simple, but elegant. It has an octagonal design which similar to the Titan’ emblem. This weapon earns a solid 9.5/10. 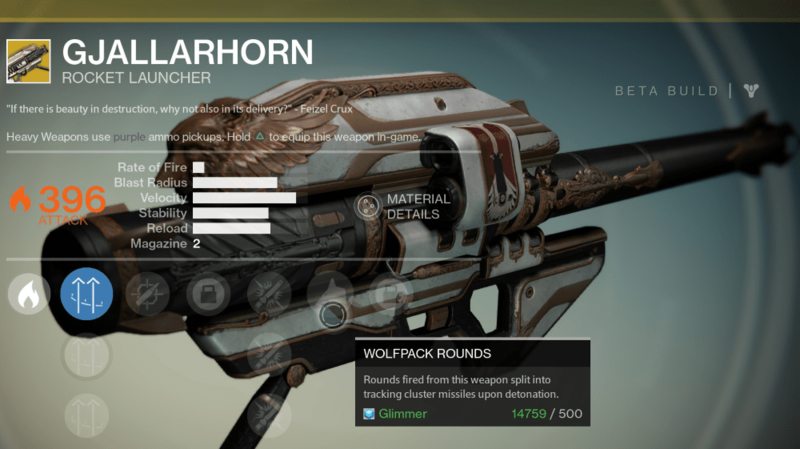 Gjallarhorn is a situational tool, and that’s OK, just be sure to know when to bring it out. It is the absolute pinnacle of rocket launchers and is best to use in objective modes. Its major issue is the lack of meaningful customization options. Since you won’t be using this for the majority of your encounters, use your primary or special Exotic, and then switch to this weapon when you have heavy ammo available.